Ya Ali Madad. 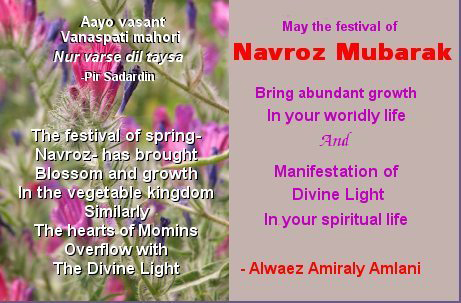 On the occasion of Idd-e-Navroz 2014, may the peace and baraka of NOOR Mowlana Hazar Imam be on you, your family, your Jamat, the Worldwide Jamat. Ameen. Let us reflect upon the spiritual dimension of our existence by thinking about the subtle body, satisfaction of the soul and higher spiritual enlightenment on this auspicious day and develop a strategy to advance spiritually in the coming year! 1. The replacement of the dense body by the subtle body. Each one of us has a subtle body which is inside our physical body. In order to enter or experience paradise, the subtle body needs to be developed through bandagi and ardent practice of faith. Those who develop their own subtle body, while being physically alive, will get a great reward of having a powerful subtle body in paradise. 2. The blessings of the satisfied soul, i.e., obtaining the blessing of reaching the status of the soul which is purified and reconciled. The status of satisfied soul is reached when commanding soul, i.e., the soul which incites to evil, is defeated by the censuring soul, i.e., the soul which advocates conversion. This is defined as Jihad-i Akbar, the most glorious war which one wages against his own vile instincts (nafs-i ammaara). The blessings of a satisfied soul are reached after winning this internal war. 3. Perfection of Intellect with Light. The satisfied soul is then perfected with Light of God. The definition of the intellect in the above sentence is related to enlightenment and not to the acquired intellect through secular education. The subtle body which gets enriched with Light becomes an eternal force in the universe.